Address: Commandant Ammunition Depot Malir Cantt Karachi No. 9. At this page, you’ll get Join Pak Army 2017-2018 Jobs in Ammunition Depot Malir Cantt Karachi. How to Join Pak Army is a common question among the job seekers who are looking to serve the nation by joining Pakistan Army but they always in search of such advertisement in which they can join Pak Army as commissioned / non-commissioned officer but if anyone doesn’t get chance to join Pak Army as commissioned / non-commissioned officer then they should try to be part of sub-departments of Pak Army located in every major city of Pakistan. 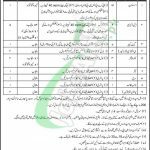 Today at this page we’ll discuss latest jobs announced to join Pak Army as Civilian at Ammunition Depot Malir Cantt Number 9 for the following positions such as (Assistant, LDC, GateKeeper, CMD (Driver), Carpenter, Tailor, Searcher, Naib Qasid, USM (Labor)). Candidates from Punjab, Sindh, KPK, Gilgit Baltistan and Karachi are eligible to apply after having a valid domicile and relevant qualification/diplomas as per the criteria such as Bachelors/Intermediate/Matric pass candidates can apply for the above-mentioned positions. It is the best opportunity for those who are looking to be part of Pak Army as civilians staff in Karachi, only interested candidates should apply as per the following how to apply procedure given below. Application form along with attested copies of educational certificate, diplomas, experience certificate, CNIC, domicile and recent photographs should reach Commandant Ammunition Depot Malir Cantt Karachi Number 9. Candidates have to attach with the application a paid Bank Draft of Rs. 200/- in favor of Commandant Ammunition Depot Malir Cantt Karachi. The last date for submission of application is November 15, 2018. Position applied for should be mentioned clearly on the right corner of an envelope. Last Date to Apply: November 15, 2018.